When you link your WeChat Official Account to Grata your WeChat menus, your welcome message, and any auto-replies (if used) will be managed on Grata, not on the WeChat backend. Grata’s auto-reply manager also provides you with a few additional features beyond WeChat. We recommend being careful with auto-replies as it can be confusing to a user in a live conversation if they mistakenly trigger an auto-reply. Implementing auto-replies in an attempt to catch keywords in the middle of a natural conversation can lead to unpredictable results. Because of this, Grata will only send an auto-reply if the entire message is an exact match. Auto-replies tend to work well when the user is prompted with a list of responses. Some accounts implement this in the follower welcome message, something like “…Reply  to request a map,  for driving directions…”. You could also involve them in a specific marketing campaign (eg. “Send ‘Happy Oktoberfest” to our account to get a special coupon for our Oktoberfest celebration.”). Grata’s Auto-Replies Manager is located in the Admin Panel, in the side menu under Content. Get started by clicking on the blue button “Create Auto-Reply” to get started. Keywords can be multilingual and are case-sensitive. Again, Grata will only trigger the auto-reply for an exact match. In the example below, a user sending the message “I have a question on the menu” will not receive the menu auto-reply, that message will be sent to your Grata console to talk to a live person. You can store text replies in multiple languages. Use the code “$username” to insert your follower’s name in a personalized message. You send a stack of up to ten cards in an auto-reply. Choose from existing cards or click “Create custom card”. If you need more help on cards, please refer to our how-to guide on cards. You may have noticed the drop-down menu option to control more granular behaviors of what happens when a user triggers an auto-reply. The default option is not to record auto-replies, but you can change this for each auto-reply. Consider recording these messages if they can give context to a conversation or otherwise help agents signal user intent. Be careful using the third option as it will automatically open a new conversation in the Grata console with an agent — you want to make sure this behavior is clearly communicated to your follower and that you don’t overly burden your agents. 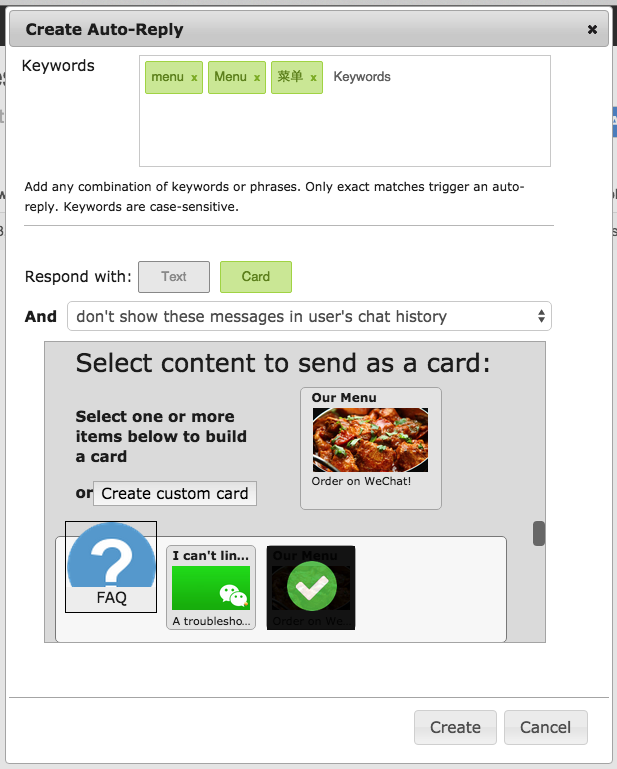 In the example in the above image, a restaurant owner might consider triggering a conversation in the console when a follower receives the instructions on how to order through WeChat. If the follower doesn’t order anything a few minutes, the restaurant could send a personal follow-up message and ask if the user has any questions about how to order.